Disney Donna Kay: Let It Go with our Spring Fling Giveaway!! Let It Go with our Spring Fling Giveaway!! Spring is a time for renewal and I can't think of a better way to renew and refresh that shopping - in particular Disney Shopping!!! 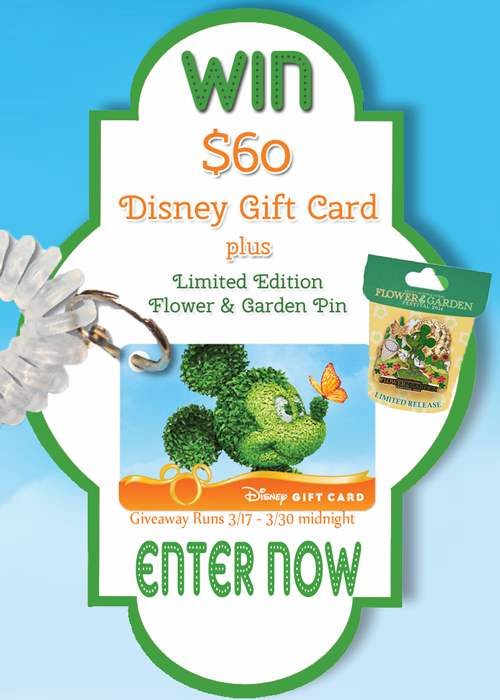 I have joined with a great group of Disney Bloggers to give you the opportunity to win a $60 Disney Gift Card and a Limited Edition Flower and Garden Disney Park Exclusive Pin! The giveaway will run from Monday, March 17, 2014 until Monday, March 31, 2014 at 11:59 PM EST. More ways to enter! There is a daily entry for more chances to win. You can enter right here on the blog. The lucky winner will be announced right here on Disney Donna Kay, after the winner has accepted their prize. This giveaway is made possible by contributions from members of the Magical Bloggers Group. Good Luck and Have a Magical Day!! I would use it towards park tickets! I would use it for our trip coming up in April for souvenirs! We are planning our next trip to Walt Disney World and this would be perfect to add to our budget for treats and souvenirs!